The Martian is a story about a team of astronauts who have to abort their mission on Mars and leave one of their crew (who’s less dead than they initially thought) behind. 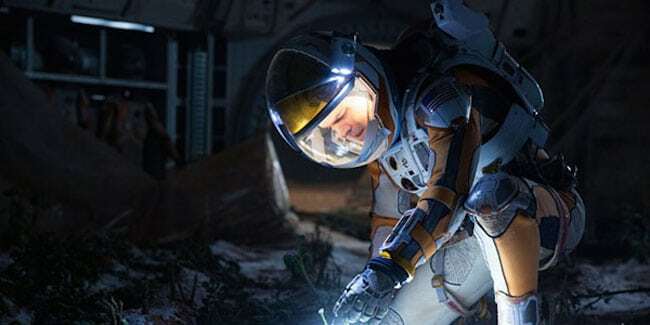 The rest of the film follows NASA botanist Mark Watney (played by Matt Damon) as he does his best to not die and finds a way to survive with limited supplies of air, water, and food. Before I go on, I just want to state that Jargon-heavy sci-fi has never been my favorite thing to read or watch, but I felt like The Martian maintained a nice balance between portraying the events realistically and keeping the story succinct and engaging. In that vein, the movie did an excellent job explaining the science behind what was happening without going full-blown physics lecture. I thought the pacing was divided well between its slower parts with general characterization and plot development and its action scenes with events caused by Murphy’s Law (if it can go wrong, it will). The most intense scene, in my opinion, happened pretty early in the film when Mark had just survived the initial mission abort disaster and basically had to perform slapdash surgery on himself to remove a piece of metal antenna from his abdomen. Stuff like that always gives me the chills though. The action and some of the problem-solving going on between Watney, NASA, and the Jet-Propulsion Lab (JPL) was very reminiscent of Apollo 13, but maintained enough of a distinction that The Martian didn’t feel like it was just lazily re-hashing bits from older movies. In general, I found the movie’s plot to be pleasantly unpredictable (unlike so many movies these days where I can guess the ending 10 minutes into the film). 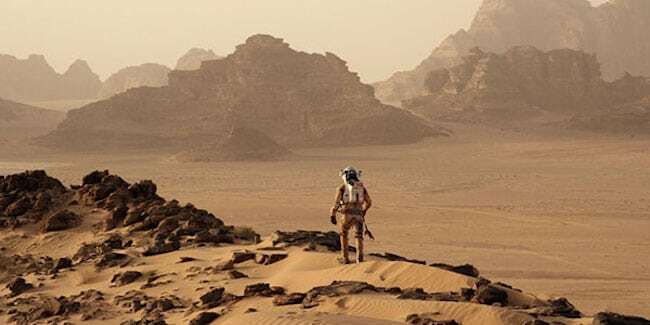 Films featuring one person’s struggle to survive against all odds in hostile environments usually tend to be some form of drama or tragedy, but one of my favorite aspects of The Martian was the humor that the character of Mark Watney peppered in. Yes, he was in terrible danger, and there were plenty of serious parts that maintained appropriate levels of gravitas. However, through it all Watney still kept his sense of humor, which especially shone through in the video logs he made regularly. Just little things, like at one point when he realized that due to some complicated rules involving maritime law that he was technically a space pirate, really humanized the character and (I felt) made him more relatable to those of us who haven’t been in dire mortal situations. I know my review has thus far focused a lot on Matt Damon’s character, but I’ve got to give credit to all the supporting characters (in the crew and on Earth). All the actors made fantastic performances, no weakest links there. The visuals were equally fantastic, and I thought all special effects (whether they were CGI or practical I honestly couldn’t tell) were flawless. Another aspect I really enjoyed was the soundtrack, which complimented the film well. With some movies you’ll get pop songs ham-fisted in a montage or two that just doesn’t feel sincere or well-placed, but definitely not so with The Martian. All songs fit in with the events going on to great effect, especially in the latter half of the film—all the way to the end when “I Will Survive” starts playing as the credits roll (my husband got a chuckle out of that). In my experience, Blu-ray audio and video are always impeccable, and The Martian: The Extended Edition is no exception. The video for The Martian: The Extended Edition is presented in 1080p thanks to a flawless Mpeg-4 encode. The presentation just delivers. Colors are obviously swayed by the palette available, after all they are on a deserted red-orange planet, but it doesn’t mean they aren’t bright and vibrant. The image leaps right off the screen with every scene having life and dimension. There is no crushing or loss of detail and it looks as brilliant as it does in theaters. The audio is right there with it. The DTS-HD Master Audio 7.1 Track on The Martian: The Extended Edition is exactly what it needs to be. The sounds are everywhere when needed and completely void when not. There are many scenes that play off the surround audio both on Mars and Earth, and the speakers don’t let down on any of them. The dialogue is well balanced and doesn’t impact the rest of the track, unless you’re laughing to hard at one of Damon’s witty remarks. Like most movies, The Martian: The Extended Edition Blu-ray came with a few extra features. Sometimes said extras can be a disappointing waste of disc space, but I was pleasantly surprised with these. The Martian’s extras included a very amusing gag real, and a handful of in-universe “promotional clips” featuring things like interviews with the astronauts and NASA officials from both before and after the events of the movie. All in all some pretty entertaining content, and well worth your time to check it all out. The biggest change here is the new release gives you both a Theatrical Release and a new Extended Edition of the film. Both are top notch in quality and both fun to watch. Overall, my assessment is that The Martian: The Extended Edition is one of the best films I’ve seen in a while, and whether you saw it previously in the theater or not, everyone should definitely go out and buy the Blu-Ray.